The world knows many popular lotteries. One of them is France Loto, played by thousands of people who dream to become a millionaire one day. Interestingly enough, France Loto is one of the oldest lotteries in the world. It was established by the French King Francois I in 1505! Not only the age, but also the high winning chance make France Loto very special.. The winning odds of France Loto are higher than most European lotteries, namely 1:16. So you have a big chance to win some nice prize money. Besides that, the way this lottery works is really simple. You need to pick 5 numbers out of a range of 1 to 49 online. There’s a special number known as the ‘Chance, which ranges from 1 to 10. Then you need to ‘shake’ the numbers. Done! This lottery has 10 prize categories in total. They’re divided into normal balls and special balls that correspond with the numbers. You need to have a least one special ball (0+1PB) to win the Jackpot. 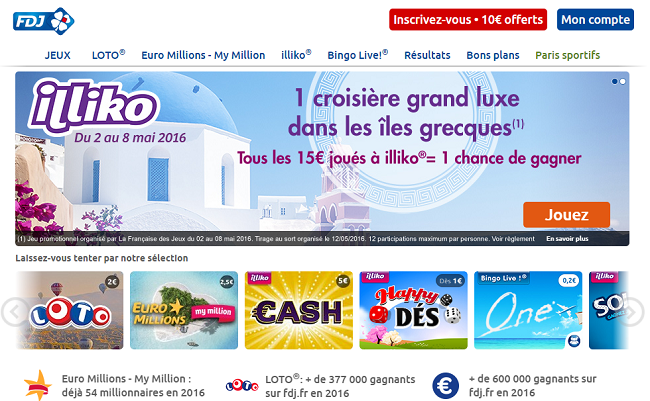 The France Loto has a fantastic Jackpot. It starts with 2 million and ends with a maximum of 36 million euros! Every time there’s no Jackpot hit the amount of money is increased with 1 million euros. So it comes a no surprise that thousands of French people are looking forward to the draw every week. It takes place at Monday, Wednesday and Saturday at 7.30 p.m. Place to be is the beautiful city of Paris. Not only the French, but people all over the world love this lottery. Every person in the world who is older than 18 can purchase a ticket online. Don’t be disappointed if you haven’t won the Jackpot. The normal prizes are great as well. It doesn’t hurt when you win 500 or 1000 euros right? These prizes are chosen after every draw, based on the number of tickets that are sold and the amount of prize money. France Loto doesn’t use taxes or commissions on your win.